A devotional and journal in one that encourages a close relationship with Jesus every day of the year.In this bestselling devotional, readers will receive words of hope, encouragement, comfort, and reassurance of Jesus unending love. The devotions are written as if Jesus himself were speaking... read more directly to each reader. Devotions are followed by a journaling prompt with lines for writing thoughts and prayers. Reading Scripture, listening to God's voice, and journaling her thoughts made Sarah more aware of His presence, allowing her to enjoy more of His peace. 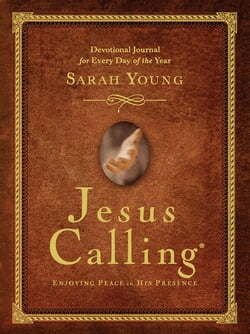 And following these steps will do the same for you.Features & Benefits: Bestselling devotional with prompts and journaling space for enhancing a daily personal time with GodProvides a chance to experience peace in His presence every dayOver nine million copies sold in the Jesus CallingbrandCover design allows for personalization "